Lung cancer research gets far less public attention and research funding than other, less deadly cancers. It’s often perceived as a disease people bring on themselves by smoking, or a disease that could have been prevented by not smoking. Until I had lung cancer myself, I didn’t even know nonsmokers could get it, and neither did most of my family and friends. In the fledgling lung cancer community, we often make comparisons to breast cancer and AIDS. We speak of a “stigma” of lung cancer, and wonder: where are our ribbons, our celebrity spokespeople, our massive public education campaigns? While the discrepancy in public awareness and in research funding angers me, I have experienced lung cancer stigma as relatively mild. This is an unorthodox thing for a lung cancer patient to say, and requires some explanatory context. I’m a lesbian. A professional career ended, very dramatically, about ten years ago when I decided to come out of the closet publicly. I’ve been a foster parent, and have had to buy formula and baby cereal with WIC vouchers. My partner is transgender (Chris doesn’t fit comfortably into either the “male” or the “female” box), and lots of people in our lives don’t know how to make sense of that. I teach college courses at a state prison, and see how the “ex-convict” stigma will dog my students forever, no matter what great things they do with their lives after release. The comparison to AIDS is particularly facile, and I refuse to make it. In the late 1980s hospital staff in many places would not even enter the room of a person with AIDS. They would leave food on a tray outside the door. AIDS raged through communities of people our society already considered diseased and degenerate: homosexuals (the mainstream media didn’t say “the gay community” yet), intravenous drug users, and Black immigrants. Some religious groups framed AIDS as God’s wrath, poured out on sinners who deserved to die. It wasn’t just the extreme reactionaries who used this rhetoric; in college, I heard it from members of my middle-of-the-road United Methodist church. Take a look at the above photograph, by my beloved friend and Philadelphia photographer Zoe Strauss. I’ve owned a print of this photograph for years and it’s hard for me to say just why I love it so much. Maybe it just reminds me that most of the bad things people say are not true. Today, with Zoe’s permission, I am posting the photograph to remind myself how terrible AIDS stigma was, and still is. 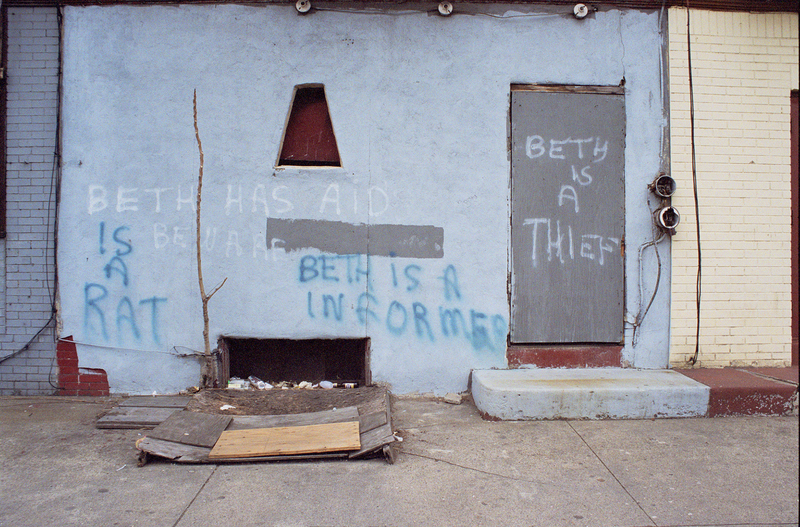 If the graffiti said “Beth has lung cancer,” would the hateful intention be as clear? On a day-to-day basis, lung cancer stigma is something I experience but can handle. On a scale of 1 to 10, I’d put being asked if I ever smoked at about a 3 on my personal rage-o-meter. To put this in context, the questions I get asked about my daughter, who is adopted and a different race from me (“Is she really yours? Where is she from? Was her real mother very young?”) are more of a 7. Being asked what I do in bed with my partner is a 10. I realize this makes me an outlier, particularly among young white women with lung cancer. Still, I think we will do the best job of fighting lung cancer stigma when we understand what it is and isn’t. An Australian professor of public health and her colleagues have reviewed most of the substantial English-language scholarly literature on lung cancer stigma and its impact on treatment outcomes. The evidence is suggestive but inconclusive. Smoking-related stigma is definitely a part of the lung cancer patient’s experience of life and death. Some advanced lung cancer patients may delay medical treatment or choose not to pursue treatment at all because they fear being stigmatized, or because the only options they know about sound painful and not very effective. Their experience of cancer can include feelings of guilt, shame, and blame. Some may even fear they will be refused treatment. On the other hand, adequate quantitative research has not yet been done to show if stigma is genuinely affecting the treatment and survival of patients with lung cancer. Chambers argues that another factor in lung cancer care is “therapeutic nihilism.” Some family doctors are not up to speed on the newest treatments for lung cancer, and may consciously or unconsciously communicate a sense that a Stage IV lung cancer diagnosis automatically means a rapid and painful death. Some patients may assume this from the beginning, and have trouble being convinced otherwise by their doctors. (See Suzanne K. Chambers, et al., “A systematic review of the impact of stigma and nihilism on lung cancer outcomes,” BMC Cancer, May 2012, http://www.ncbi.nlm.nih.gov/pmc/articles/PMC3517321/). I don’t actually think lung cancer stigma is the main reason for the huge discrepancies in research funding. I think what makes the biggest difference in research funding is a large, organized, educated community of people who demand more research and smarter research, stigma or no. This kind of organized community is the reason breast cancer research has so much funding now. Breast cancer advocates began organizing decades ago, when diseases that affected mostly women got very little attention from the research community. We may be just on the brink of creating that kind of community of people who care about lung cancer – thanks, in part, to newer treatments that help us live beyond our initial nihilism and feel well enough to take action. The good news is that we don’t have to overcome stigma first and then fight for more research funding. People with AIDS proved that you can have a tremendous impact on medical research and health care even when the general public still wants you to drop dead. The Lung Cancer Social Media community will be discussing lung cancer stigma this Thursday night at 8 pm Eastern time (5 pm Pacific). You can find out more here: http://lcsmchat.wordpress.com/2014/02/07/lcsm-chat-13-feb-2014-brainstorming-how-do-we-erase-the-stigma-of-lung-cancer/. Please join us! I’ve said my piece; I’ll be trying to mostly listen. This entry was posted in Uncategorized and tagged stigma. Bookmark the permalink. Thanks for sharing your thoughts in advance of the 2/13 #LCSM tweetchat on lung cancer stigma. I can see it would be hard to fit all of your thoughts into 140 characters! I’m glad you haven’t personally experienced significant stigma associated with lung cancer. I can certainly see how being asked “Did you smoke?” would pale in comparison to some of the other prejudices you have encountered in your life. As a lung cancer patient, my concern with the stigma of lung cancer goes beyond being asked if I smoked. Studies presented in the session on “Stigma and Nihilism” at IASLC’s 15th World Conference on Lung Cancer in October 2013 found that for lung cancer patients, perceived lung cancer stigma correlates with higher levels of depression and anxiety, as well as poorer quality of life. Cataldo et. al found lung cancer is associated with greater levels of psychological distress than any other cancer. Sinclair et al (an Australian study) found stigma relating to lung cancer was reported by both patients and health professionals and was related to poorer QOL and higher psychological distress in patients. I agree that one of primary goals for lung cancer advocates is to increase funding for research. While there is no proof that the stigma of lung cancer is responsible for lung cancer getting less funding than the other top three cancers, I have a hard time believing stigma doesn’t play some role in funding realities. I’d think the US government would want to aggressively fund research into early detection and treatment of the second biggest cause of death in the US (only heart disease claims more lives, according to the CDC). What other reason could there be for providing a higher level of funding per death to cancers that kill fewer people? Perhaps their reasoning is similar to what the American Cancer Society apparently uses: funding earmarked for lung cancer should go primarily towards stop smoking campaigns. Thanks for joining into the stigma discussion. Together the community will find a way to advocate for more funding, more effective treatments, and early detection options for all lung cancer patients. Wow. That was good. Thanks for sharing your perspective. Wow, indeed. That was really something. Thank you for busting open this discussion. And thank you, Janet, for a great reply. So much food for thought. I think of the AIDS comparison not because I think we have it as bad as that (we absolutely do not by any measure), but rather because that seemed like such an enormous and insurmountable obstacle, and yet advocates were able to get funding for research and treatment. You write, “People with AIDS proved that you can have a tremendous impact on medical research and health care even when the general public still wants you to drop dead.” THIS is the amazing part. How in the world did they do that? Thank you for sharing this. Excellent post. Glad you are back at it Beth. I learn from you every day.